Olyvia, 11, Landon and Hunter, both 13 practice shooting in the prone position. In Louisiana, when you think about kids learning to shoot a rifle, you usually think hunting. For John Hashagen, he pitches it as a way to an affordable college education. The West Feliciana Parish Manager also serves as head coach of the parish’s 4-H Rifle Team. His son now competes on the Rifle Team at Morehead State University in Kentucky. 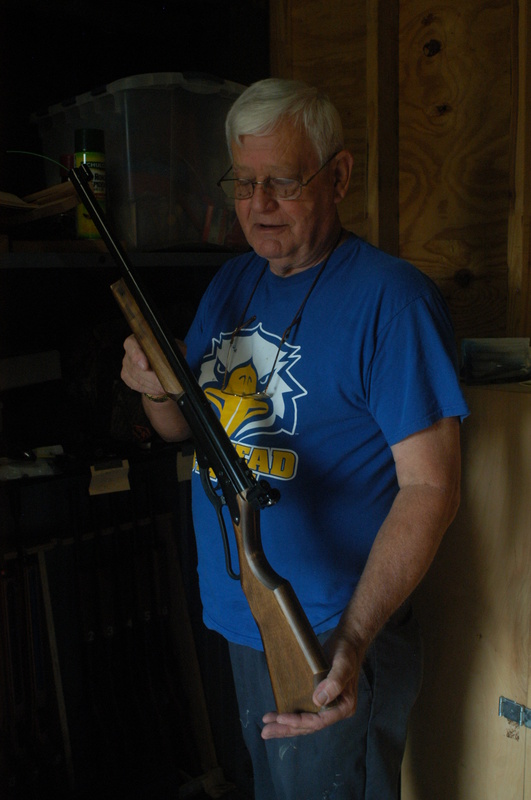 Coach John Hashagen displays one of the Daisy Avanti bb guns his young students use to practice shooting. He said about 35 colleges across the country have rifle teams and he has created somewhat of a pipeline over the last four or five years as participation has increased from about 40 kids when he started coaching eight years ago to 152 kids, who will be participating this year. He said almost all of the kids who graduate from the program go on to receive scholarships. He said in his eight years as a coach, his students have gone on to attend, on scholarship, schools such as the Air Force Academy, University of Akron and Tennesee Tech. “I think it’s a good sport for kids to get into at an early age because it’s a sport that virtually every kid can participate in. It has individual and team competitions and it teaches them discipline, which a lot of kids lack these days,” Hashagen said. 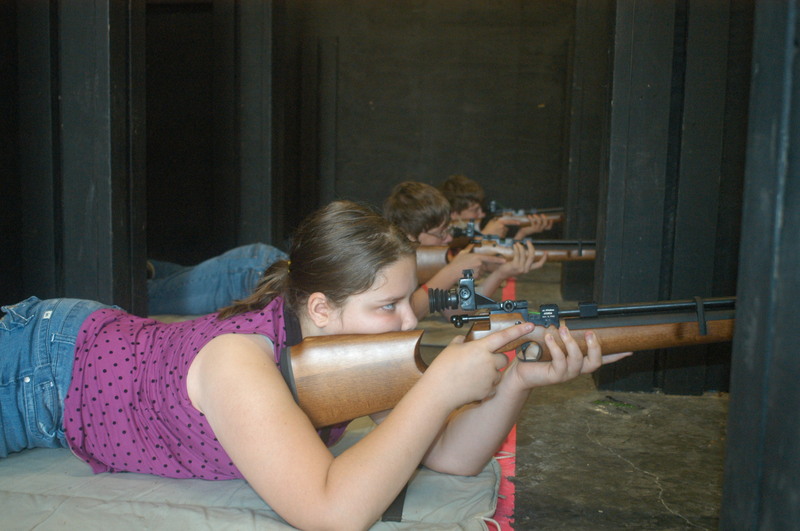 With 4-H, the smaller kids will use BB guns for practice and sporter rifles for competition. The West Feliciana team’s rifles were purchased with a $12,000 grant from the National Rifle Associations Friends of the NRA program. Hashagen also credits the LSU AgCenter with providing him with the means to become a certified coach, as well as providing the liability insurance policy that is required when transporting the kids to and from competitions. Hashagen admitted that the sport can be cost prohibitive as they get older. A precision rifle, required for college competition, costs about $2,000. This is along with almost $4,000 in additional equipment. “But I also tell parents to think about it this way, we are paying $2,500 a semester for our son to attend a school that costs $14,000 a semester,” Hashagen said. On Saturday, the three Sonnier children were setting up for practice. All joined last year and already have long-term goals for the sport. Olyvia, 11, is looking to beat her current high score of 141 and to get past qualifying rounds of the Junior Olympics to compete on a national level. Landon, 13, hopes continuing to develop his shooting skills will help him when he looks to join the military after high school. He hasn’t decided which branch just yet. Hunter, 13, is looking to steadily improve in local competitions before moving up to bigger competitions. Hunter and Landon’s determination has also turned into a bit or a competition between each other as well. “When we got the notice that there were spots available for them, I took them to sign up that same day becuase they had been asking to join for a while, said their mother Tina Sonnier.